This isn't candy. Nor is it splinters of wood from a multi-colored tree. 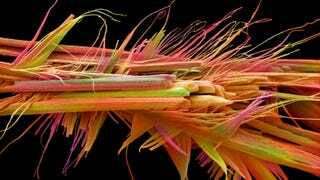 In fact, it's a false-colored scanning electron micrograph showing caffeine crystals in close-up detail. No wonder the stuff gets you going first thing in the morning. Photographed by Annie Cavangh and David McCarthy, the image was one of the winners of this year's Wellcome Image Awards. This crystal group, formed on the end of a larger crystal, measured around 40 microns in length.